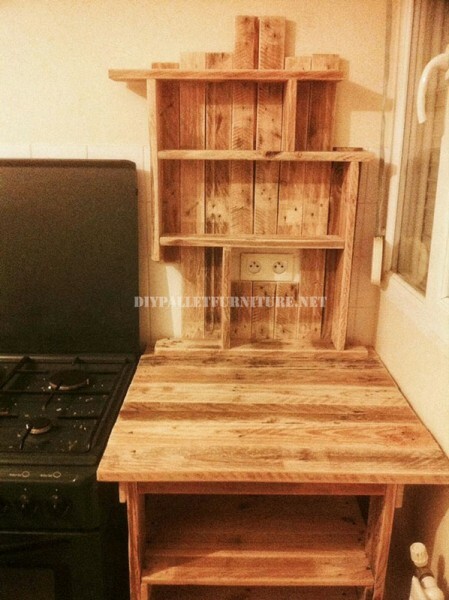 From “Les palettes du coeur” We keep recieving great pieces of furniture made pallets, today I want to show you how to improve your kitchen with a few wooden planks, of course extracted from a few pallets and sanitized, cleaned and sanded for the occasion. This practical furniture can make your life easier incredibly, in the case that we have a dead space in our kitchen and we need a convenient surface where to work, it also will give us a lot of storage thanks to its top and bottom shelf system. As you can see in the photo above, the table is a practical cooking surface, Thanks to its wooden origin and rustic air it’s very suffered. The upper shelves, built with an irregular and chaotic air, give the aesthetic touch to the furniture, they are small and shallow so they are more suitable to save the species and small bottles; instead the bottom shelves have a large space so are more suitable for storing pans and pots. Another highlight are the holes that we can find in the wood to access to the wall sockets, where we can connect the electronic cooking utensils. 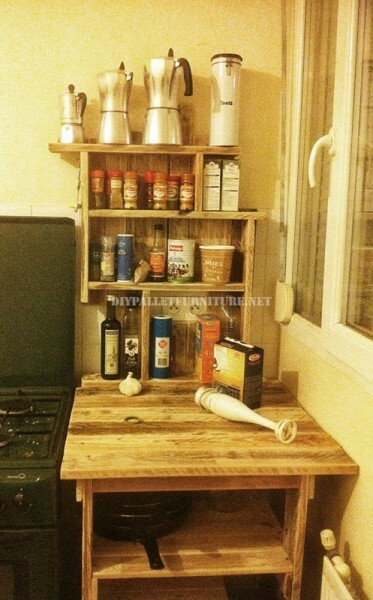 Do you like this pallet furniture for the kitchen? Do you want to look for more pallet tables?